While the world looked on in horror as a pair of Coptic Christian churches were bombed by ISIS in Egypt, Christians elsewhere in the Middle East were experiencing a triumph over the terrorist organization. Iraqi Christians were able to celebrate their first Palm Sunday in three years. 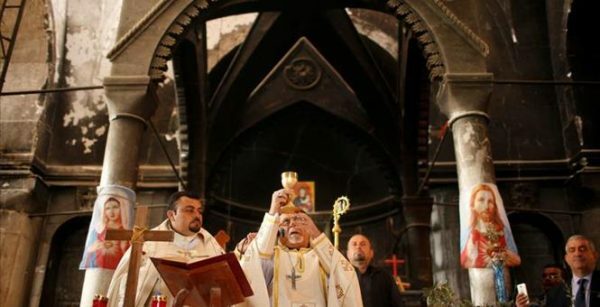 On Sunday, Christians were able to return to the Christian town of Qaraqosh and celebrate Mass and the start of Holy Week for the first time since ISIS took over the city in 2014. The area was liberated in October of 2016. But on Sunday church bells rang again across the town. Hundreds arrived in cars from Erbil, the main city in autonomous Iraqi Kurdistan where most Christian had fled when Islamic State gave them an ultimatum to pay special taxes, convert or die. “We need reconciliation,” Syriac Catholic Archbishop of Mosul Butrus Moshe told worshippers in the Immaculate Conception Church guarded by army jeeps. Islamic State has targeted minority communities in both Iraq and Syria, setting churches on fire. Scribbled “Islamic State” slogans could be still seen on the church’s walls while torn-up prayer books littered the floor. Please keep Christians in the Middle East–and all persecuted religious groups worldwide–in your prayers.